The Harvey, Eisner, and YALSA award-winning and critically-acclaimed series, The Umbrella Academy returns with a seven issue story arc, titled The Umbrella Academy: Hotel Oblivion. Original writer Gerard Way (My Chemical Romance, The True Lives of the Fabulous Killjoys, Doom Patrol) and artist Gabriel Bá (Two Brothers, Neil Gaiman’s How to Talk to Girls at Parties) with colorist Nick Filardi (Forbidden Brides of the Faceless Slaves in the Secret House of the Night of Dread, The Victories), and letterer Nate Piekos (Stranger Things, Briggs Land) are signed on to bring more Umbrella Academy adventures to life. Dark Horse Comics will continue to publish the fan-favorite comic story epic, soon to be a Netflix series. 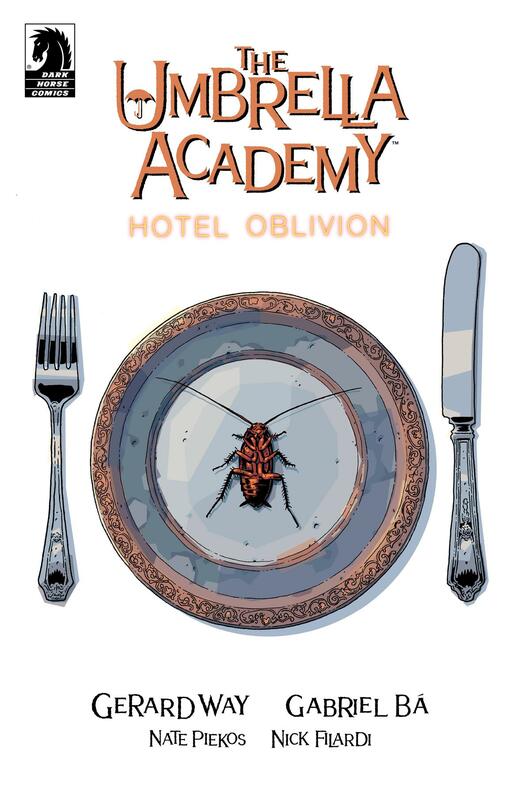 The Umbrella Academy: Hotel Oblivion #1 (of seven) arrives this October 3, 2018 at comic stores everywhere.